Remember our amazing Training Video? *You don’t have to like our clip to ‘LIKE’ our clip. You just have to like us and our project! And remember our intention to make a movie about the tour? Editing is officially underway. We’re sifting through tonnes of beautiful footage, carefully selecting only the best for your viewing enjoyment. Stay tuned. And most of all, a huge thanks to our dear parents, who provided us with constant moral support and occasional pampering. You know all those things you were supposed to do before we’re famous? .. Too late. Don’t live in Delta? Check out the online version of this article. Newfoundland is kind of inkblot-shaped, with peninsulas jutting out in every direction from the line traced by the Trans Canada Highway. Here, everyone just calls it the TCH, which makes it sound like a mind-altering chemical compound. 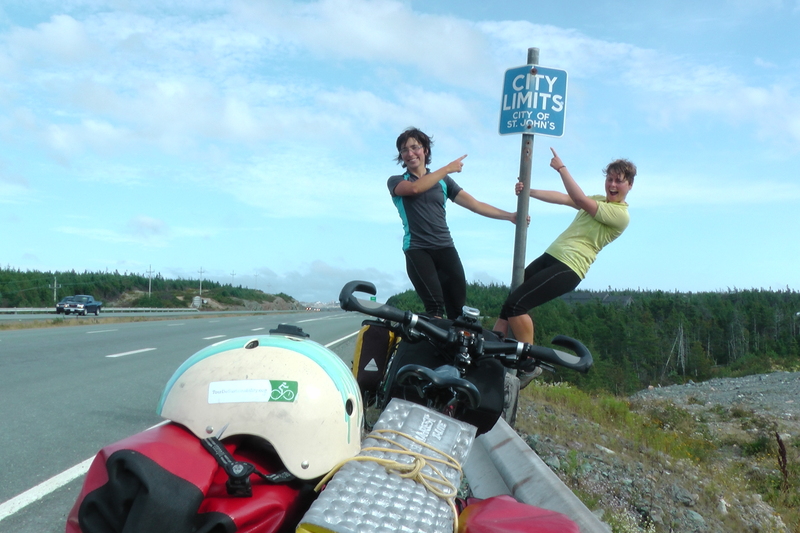 We’ve mostly been following the TCH, since it’s the only way to get from west to east in most parts of the island. 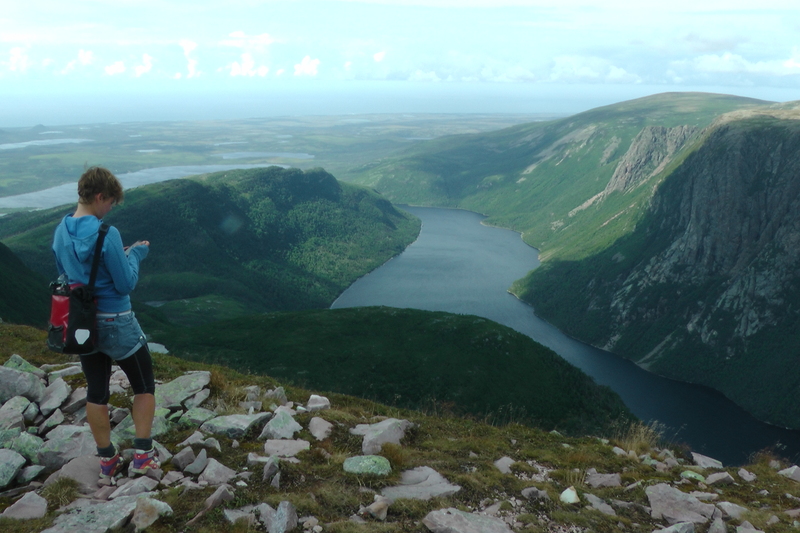 Based on overwhelming recommendations, we made a detour for Gros Morne National Park. 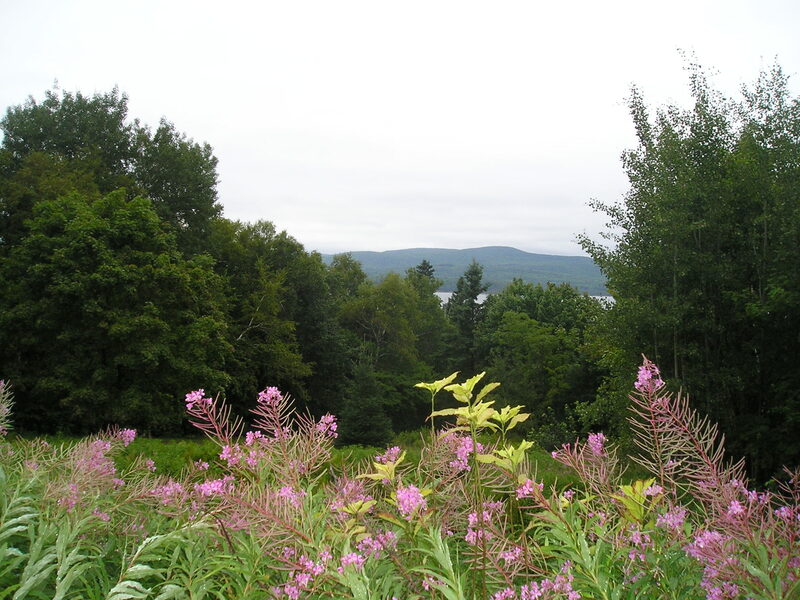 The park is situated on the largest of Newfoundland’s many protrusions, and to get there from the TCH is a day’s worth of cycling on hilly terrain. We were obliged to add 3 days to our journey: one day there, one day to hike, and one day back. Gros Morne Mountain is the 2nd tallest peak in Newfoundland, a 806m summit. 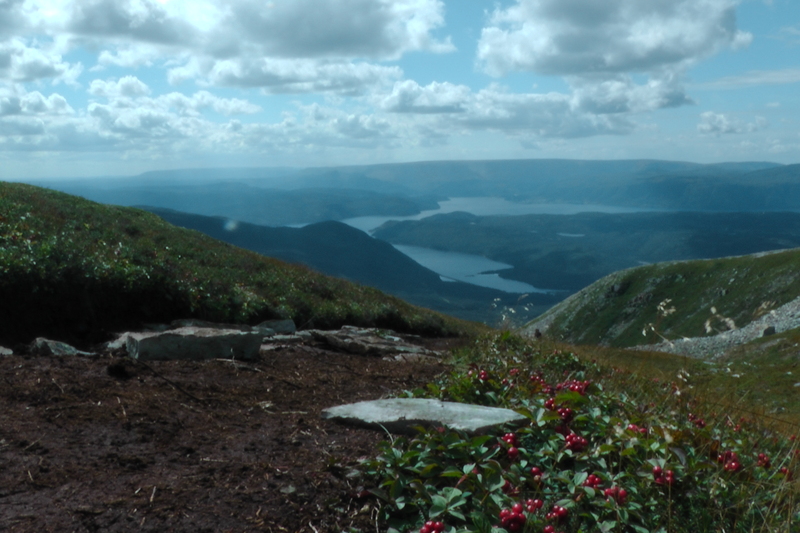 The hike is 16km to the top and back, and it’s described as ‘strenuous’ in the information booklet. We were stationed at the nearest campsite, a hilly 13km away from the trailhead — a warm-up for our rest day. 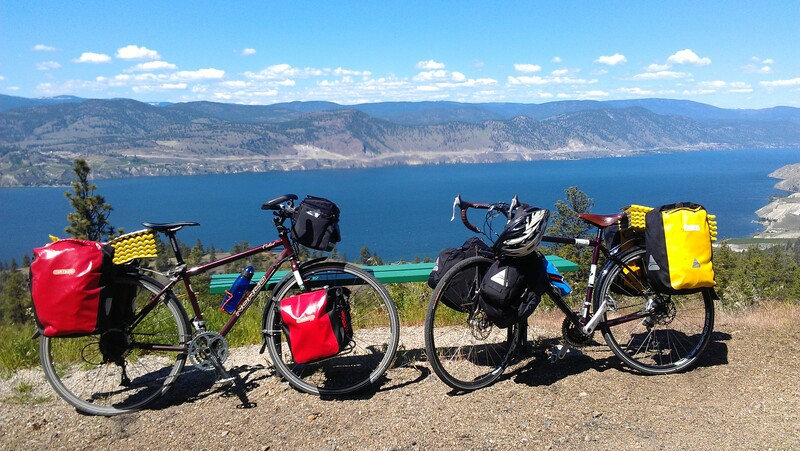 With pedal clips on our shoes and a pannier for a backpack, we headed up. We won’t lie — it wasn’t easy. Our legs were sore for the next few days. But the unique tundra landscape made it all worthwhile. Lately we’ve been doing a lot of ninja camping. It’s called ‘ninja’ camping because the idea is to remain well hidden, possibly because you are not technically supposed to do it. 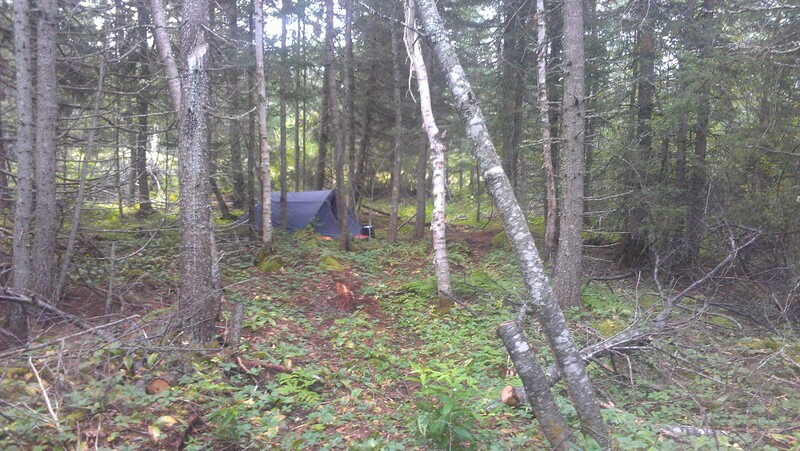 In Canada, though, it’s legal to camp on crown land, and most people with huge properties wouldn’t care or know you were camping there. It’s free, it can be more peaceful than paid camping, and it’s very easy to do in remote places. However, one forfeits access to a shiny (or not-so-shiny) flushable toilet, sink with running water, laundry room, wireless internet, a manicured lawn or wooden platform to put up your tent, and other goodies that might be available at a paid campsite. We have found that ninja camping is a good excuse to spend extra money on pies. The fall weather has moved in already: we had another wet and windy day. It felt like cycling through a cloud with the wind spitting the misty precipitation in our faces. It was a relief to finally arrive in Gander, where we couchsurfed with Randy and Sharon. They were wonderful hosts, and made sure we got plenty of calories for the road. Randy told us about the job situation in Newfoundland. Historically, cod fishing was the main industry, but in 1992 the government put a moratorium on cod fishing and compensated the fishermen who lost their jobs as a result. Since then, there’s been a trend for people to go work in oil extraction “out west,” that is, mostly in Alberta. A job in the oil sands pays significantly more than an equivalent one in Newfoundland. Randy has worked in Fort McMurray and shared his first-hand experiences with us. “Fort Mac” is not a fun place to be: that’s why the pay is so high. It’s hard work in an unpleasant, toxic environment. There is not much to do besides work, and nowhere to spend money, but the money keeps pouring in. Gambling is not allowed but of course people play poker for high stakes, and some end up losing their earnings. When the workers are back home on their time off, they spend. The cash seems endless, because there’s a lot of it all of a sudden. Many people buy expensive things: a truck, a house, a boat, an RV, a skidoo… They end up with debt. No matter how much they hated Fort Mac, they need to go back again because they have loans to pay off. Randy has met some people who started with a financial goal in mind, but are unable to stick to their plan, accumulating more debt instead of saving. Of course, those without a plan to begin with are even more susceptible to the lures of expensive stuff. Randy says a lot of younger people are unable to keep tabs on their budget. Nowadays you don’t need to travel to Fort McMurray for oil jobs. 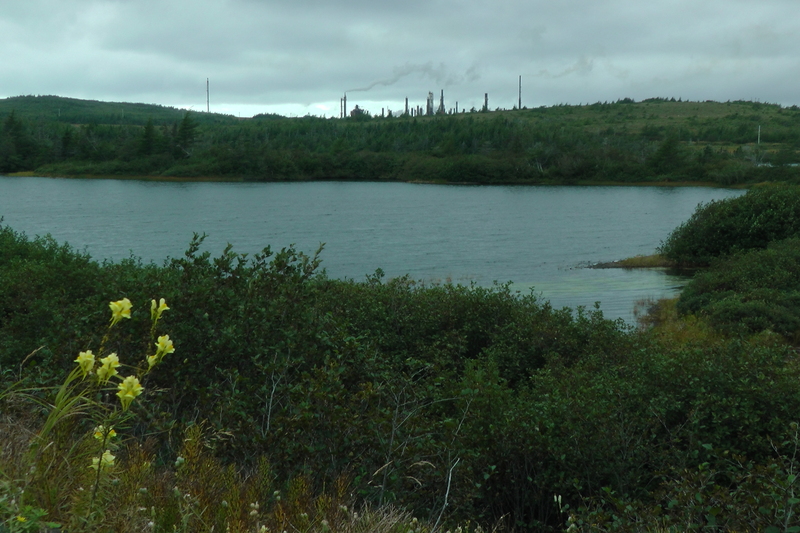 For example, we cycled past a foul-smelling refinery near Arnold’s Cove. 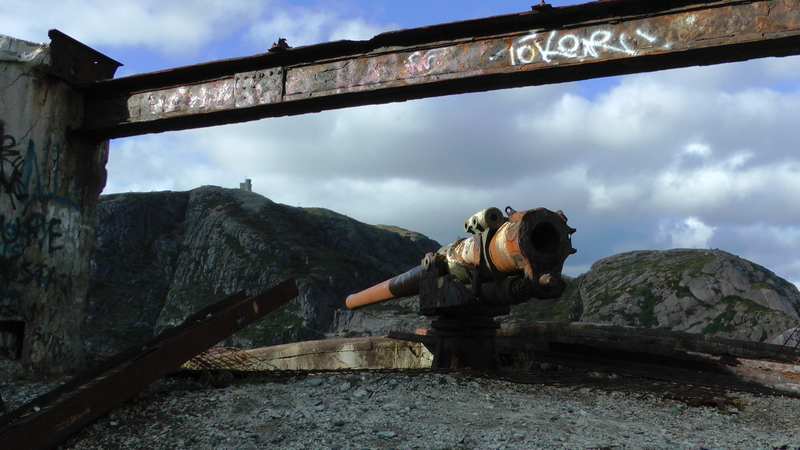 In the last decade, the offshore oil industry has been rapidly developing in St. John’s. This has brought new job opportunities and capital into the city. The city is now considered one of World Energy Cities and the unemployment rate is one of the lowest in Canada. These benefits come at a price: inflated prices for living, environmental degradation, and more big trucks on the narrow roads of St John’s. After speaking and planning with the Tour de Sustainability team for over a year about this trip, I hopped on the train with my bike and finally met up with Anya and Maria in Amqui, QC. As luck would have it, I joined them for the rainiest part of their trip, it rained 3 of the 4 days I was with them from Amqui, QC to Moncton, NB. It was so great to see Anya and Maria and hear firsthand about all of their experiences during the cycle trip across Canada. These ladies are machines!! During our first stop for lunch at a roadside café somewhere near Matapédia, QC we decided to eat outside to continue enjoying the lovely day. Good job we did ’cause it rained for the rest of the afternoon! Our food came in styrofoam containers just because we were eating outside on the patio. I am sure our table was closer to the kitchen than some of the tables in the dining room. 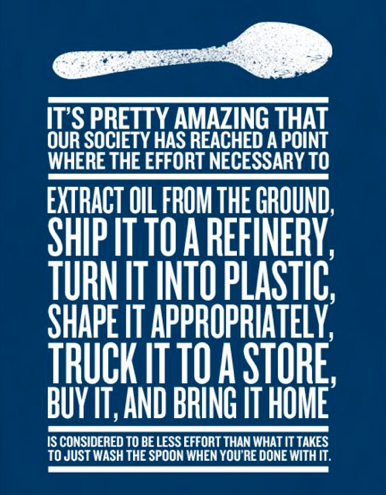 This got us into a conversation about plastic and how our culture is so quick to use disposable items. During our continental breakfast the next morning at the hotel (so generously booked for us by some colleagues in Campbellton, Thank You Jocelyn and Bob!) all of the plates, utensils, cups, and condiments were wrapped in and made of plastic! After breakfast we headed off towards Bathurst on a beautiful ride along La Baie de Chaleur. 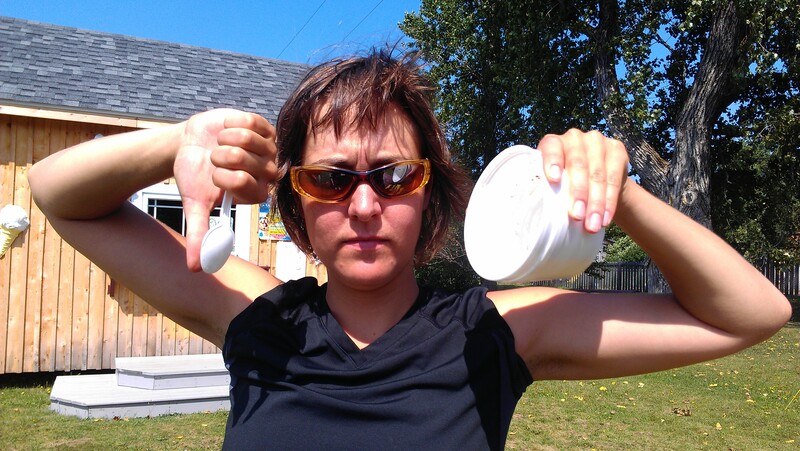 During the many pedal rotations I decided to write a guest blog for Tour de Sustainability about plastic and Anya has held me to it! So big deal if we eat a few pieces of plastic in our seafood. It shouldn’t change the taste, right? Well, plastic leaches harmful chemicals within our water systems, wildlife, and in our own bodies! Here is a cheeky video that might not be too far from reality. Even the amount we do recycle gets down cycled to less valuable products which eventually end up with the same destiny. It might be time for us to start rethinking the way and frequency with which we use plastic. Once you start paying attention and avoiding using single use plastic, it becomes second nature. This goes beyond carrying your own bags to the grocery store, although this is a good start. This means being ready to refuse certain products if they are packaged in plastic, saying no to straws, bottled water, and using containers instead of plastic wrap. Mason jars are super handy and multi-use! In fact, you will probably even begin to notice that food that isn’t stored in, wrapped in, reheated in, or served on plastic actually tastes better! If you don’t believe me give it a try for a few weeks. Despite my plastic rant, the bike trip was fantastic. 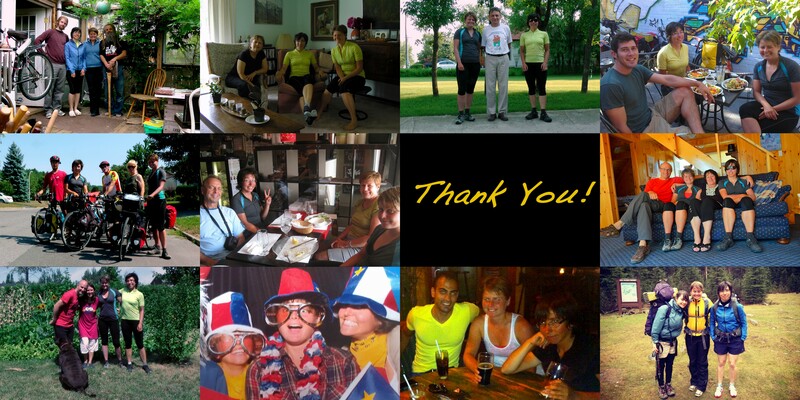 It felt great to bike through my home province and I felt so accomplished after biking 470km in 4 days and blown away by the enthusiasm in Anya and Maria as they crossed 7000km (now well past 9000km). Covering distances by bicycle makes our communities, provinces, and even our country feel more scalable to human pace and life. 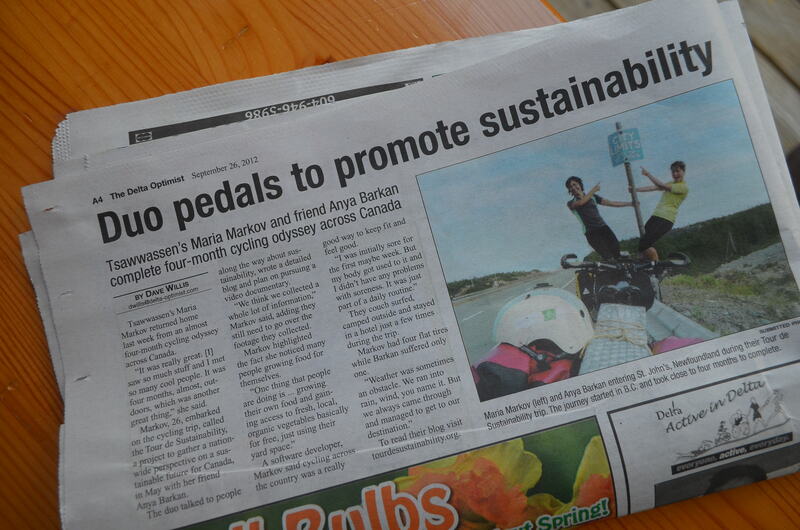 Way to go Tour de Sustainability – All the best to Anya and Maria on the last leg of their trip!